We are grateful for allies as well as POC + Q + T (people of color, queer people, transgender people) who seek to bolster the work of centering marginalized voices. Please use this Collaboration Guide to learn how to best collaborate with us in Our Movement Forward event spaces and how to responsibly amplify our message to your networks. ● Even well-intentioned allies can inadvertently disempower the very people they wish to support. An educated ally is a caring and effective ally! This is a list we ask you to keep in mind. This is our best effort to set an intention of grace and community building across many dimensions of privilege/oppression for the well-being of us all. We respectfully thank you in advance for your understanding! ● Be wary of using any sort of ‘savior complex’ narrative. This narrative says, “We have to save these poor oppressed people!” A more subtle iteration of this is, “Allies will build this movement, then we’ll give leadership to oppressed people later.” Historically, this transfer of leadership has very rarely happened. If your intention is to center POC + Q + T voices, that has to be the case from the beginning. Trust that the Holy Spirit has shown up in our own lives, that we already have our own leaders, and that you can collaborate†with†us without undermining our underestimating our agency. ● Please be aware that there are people attending this event who are not men or women. If you send out promotional emails that start with ‘Brothers and sisters,’ please use ‘Beloved family,’ ‘Siblings,’ or another gender neutral greeting. ● Please don’t talk about our rights as an ‘issue.’ It is offensive to say, “If we could just get past the homosexuality issue, we could be saving lives doing disaster relief!” We understand that disaster relief is important, but please understand that this ‘issue’ is our whole lives—our lives do†depend on how we proceed with this. Similarly, whatever matters you find most pressing and urgent also affect POC + Q + T communities exponentially. They cannot be isolated. ● If you see another ally un/intentionally doing something harmful, please do something about it (find a way to gracefully intervene, have a conversation afterward, tell a group leader who can navigate it, etc.). Do not use this as an opportunity to distance yourself from “less woke” allies. This leads to thinking like, “At least I am not one of the racist ones,” when we should all be aware that if you grew up in North America, Europe and most Colonized countries, you most likely have internalized racism. Treat each other like siblings on a journey. ● See “What to do if you mess up” in the last section below. ● Please be wary of false dichotomies. Throughout this discourse, we’ve heard a lot of “We have to listen to both sides of this issue to be fair.” In this framework, centrists see themselves as ‘bridges’ between more conservative people and ‘radicals.’ While we value relationship across the body of Christ, please understand that what is being labeled ‘radical left’ is truly the most basic and foundational principles that POC + Q + T people require to survive. Desiring to live free from oppression and violence is far from radical. And - radical voices and ideas are pivotal for the full vision of the gospel. ● Centering POC + Q + T voices means exactly that — centering those voices. It doesn’t mean that you have to be completely silent (and sometimes being too silent can create an extractive/spectator dynamic.) It does mean, though, that you intentionally create space for oppressed people to say everything that we need to say and you mind how much space you take up. 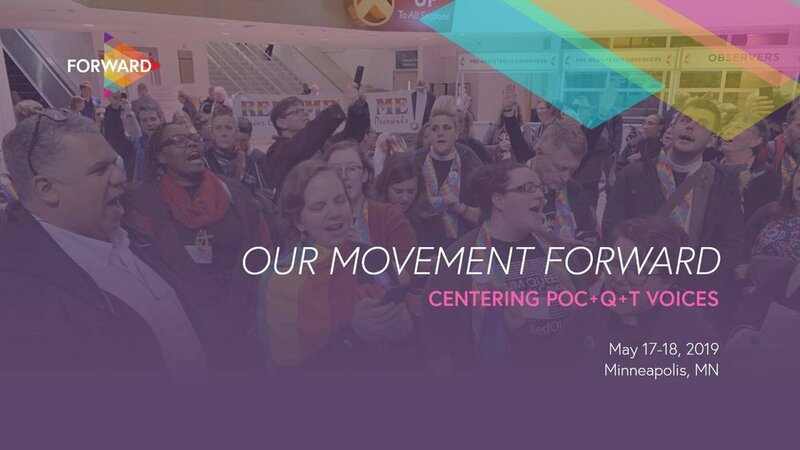 Consider, for example, that Our Movement Forward is one of the only national gatherings that is setting the intention to center POC + Q + T voices. There are many, many venues for centrist, white, cishet United Methodists to share their views. Please hold this space as sacred,for us to share ours. ● If you need to take a break or move, you always have permission to do so. Please take advantage of one of the meditation rooms that we have onsite. ● One of the effects of trauma is perpetually being in a scarcity mindset. Notice when cynicism and despair (“this is never going to change,” “a person like that will never be part of my movement”) arise. Accept that those narratives are only part of the picture, and that we can hold those narratives while also inviting wonder, curiosity, patience, and delight. ● Oppression comes in many different dimensions. If you are queer and white, that does not mean that you have had the exact same experience as someone who is queer and a person of color (or someone with a disability, or an undocumented immigrant, or a trans person, etc. etc.). We are not here to play ‘the suffering Olympics,’ but we do ask that you stay mindful of all these dynamics. ● Ultimately, the intention of this space is to start constructing a new future. It is very easy to name what is wrong or how nothing will work. Of course, do voice any concerns you have about the proceedings of our conversation, but we also challenge you to meditate: what if a new world is actually possible? What if there are spaces that I can be trusting and not have to constantly defend myself. ● Your body may want to panic and go into fight or flight mode. This often manifests in reactions such as,“OH MY GOSH, I am so sorry, oh I am so sorry” and other words to justify yourself including, “But I’m still one of the good ones, right?” These are often accompanied by a lot of tension and tears. As you can imagine, these types of responses end up putting a burden of more emotional labor on the person you just offended because now, in addition to having to deal with the original offense, they now also are put in a position of having to console you. Instead of creating this unfortunate scenario, take a pause and calm your body down. It is possible to show sincere remorse while owning your own emotional work.